Please write “ESTERA PIROSCA ESCOBAR” on the check memo line or in the memo or account field in your online bill payer. I come from the beautiful land of Braila, Romania and I was blessed to have the opportunity to pursue higher education as an international student in the United States. I experienced firsthand what it means to be lonely, to feel homesick, and to go through culture shock. But I also experienced the Christian community’s love for internationals and their dedication to serve and share the Gospel with young people from all over the world. 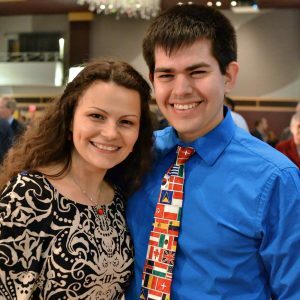 I have been involved in international student ministry (ISM) since I first arrived in the US, in student organizations, a church-based ISM, and IFI. As I think about reaching the nations, I think about international students and how strategic and effective they can be in taking the Gospel back to their homeland. It is a privilege for me to join God in His mission to draw to Himself a people from every nation, tribe and tongue. In my current role as National Field Director I assist the City Directors, and others leading IFI ministry locations, to be successful in their ministries by providing care, helping them to stay focused on the vision of IFI, and providing an administrative connection with the IFI organization as a whole. I am also significantly involved in coaching staff in the cities that are using the IFI startup kit. My love for cultures permeates not only my ministry and professional work, but also my personal life. In July 2015, I got married to Francisco, a wonderful man from Chile. We live in Grand Rapids, Michigan and together we minister to internationals in this area. God gave me an international heart. He gave me a passionate heart to love the sojourners. I cannot fulfill this calling alone. Would you join me in reaching the nations at our doorstep in order to see God’s Great Commission fulfilled? Through joining my team of prayer and monthly financial supporters together we can make an impact for Christ among the nations.